Hacking has been in the news a lot recently – yet sadly so many people are still using passwords that are far too easily cracked. 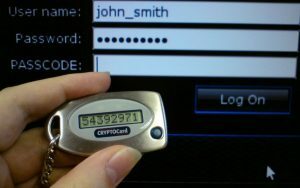 Hackers will use a variety of methods to access data, one of which is a brute force attack where they try many permutations of well known passwords in a bid to gain access. So – what can you do to protect yourself? Use different passwords for your various logins, from email to online shopping to social media. The ideal password length is 12 or more characters as it makes it harder to be hacked by guesswork. 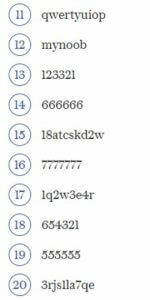 Most people understandably struggle to remember all of these passwords given how many we have now. If that is you then do take a look at a password manager utility. These allow you to create one, very secure password to access that utility which then creates secure passwords for all your other logins. However, it goes without saying that losing this one password puts everything else at risk! Consider using 2 factor authentication. This is similar to how most people access their online banking, with a device like the one shown below. They offer much greater protection if they are available for the system or service you are using.